The politics of neglect which has long governed Cairo's expansive informal spaces looks set to remain well into the post-Mubarak era. Egypt and the Muslim Brotherhood backed government of President Mohamed Morsi face a difficult Spring. In the absence of external intervention and financial credit, Egypt’s hard currency reserves, necessary to fund essential imports of food and energy, are likely to be exhausted by March/April. While there is no obvious end to the political deadlock between a democratically elected government unable to enforce its authority, and an opposition which refuses to accept the legitimacy of the Islamist-supported government and is unable to constitute a plausible alternative. 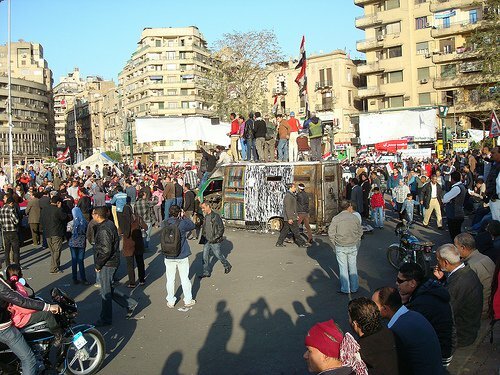 Friday demonstrations in Tahrir Square. WJ Dorman. In this context, a recent Daily Telegraph blog post by Richard Spencer, the paper’s Cairo correspondent, frames Egypt’s present discontent in what he describes as the “physical destruction” of its cities by “50 years of (Nasserist) socialist nationalism.” In his view, Cairo’s urban pathologies of infrastructure and governance are “Soviet,” a reflection of Egypt’s cold-war alignment with the eastern bloc through the early 1970s. However in the latter stages of his post, Spencer abruptly (and perhaps unwittingly) changes ideological tack, locating Cairo’s decline in the excesses of late-Mubarak neo-liberalism: the growth of elite communities on the metropolitan area’s desert periphery since the second half of the 1990s. Purportedly manifesting a Pharaonic pattern whereby successive Egyptian dynasties abandon the capitals of their predecessors, this desert development boom reflected an exclusionary and ultimately impractical approach to urban development. Like many accounts of developing world urbanism as impending disaster, Spencer relies on a mix of assertion and association, rather than empirically supported analysis. There is little evidence of Soviet town planning in Cairo. Egypt’s elites have historically looked to Paris and Britain — not Moscow — for their inspiration. But Spencer is very correct in noting that Egypt’s elites have pursued an exclusionary approach to urban development, most evident in what he seems to call the “huge tumbledown tenements” of Cairo’s “inner suburbs.” Such areas are largely informal, established on land not officially sanctioned for urbanization and hence developed outside the umbrella of state regulation, planning and services. While the Nasser government’s nationalist state-building project is sometimes represented as having returned the capital to its indigenous inhabitants, in fact formal urban development since the 1950s largely benefited regime-linked constituencies. Despite construction of some highly subsidized ‘popular’ housing and middle- to upper-income sub-divisions, the general expansion of the existing city had largely stopped by the mid 1960s, inflating urban land and thus housing prices. Although its local government system has been aptly described as “designed for dictatorship,” the Egyptian state seemed unable to halt the informal urbanization process. 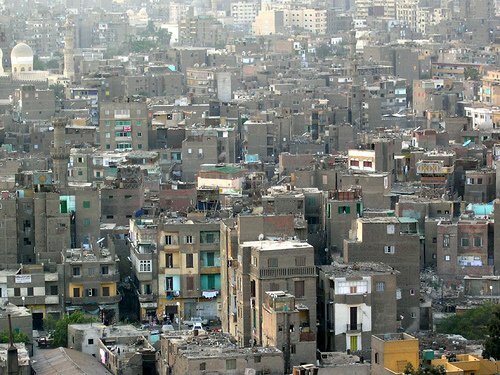 Indeed, its governance of the capital can be characterized as a “politics of neglect” in which state resources have been directed largely towards the city’s elite neighbourhoods with informality serving as an ersatz means of rationing public services to Cairo’s burgeoning subaltern zones. In other words, successive governments effectively tolerated, if not tacitly encouraged, informal Cairo as a cheap means of allowing ordinary Cairenes to house themselves at minimal expense to the state, thus preventing housing from becoming a source of political discontent. However such de facto policies of neglect led to the consumption of scarce farmland around Cairo (and other Egyptian cities), profound urban service deficits, extremely densified communities and substantial sectors of the city in which there seemed to be little formal state presence, or where the state co-existed with a variety of semi-autonomous local forces and social formations ruling through clients and proxies. These included Islamist groups who provided social services and mediated with the state. In the late 1980s and early 1990s, militants established themselves in several informal areas, clashing with the Mubarak government after the (somewhat premature) proclamation of an “Islamic Republic” in one district. Perhaps the only serious effort to address Cairo’s problematics of growth were undertaken by western and multilateral donors — concerned with the vulnerability of the Sadat government (then a western ally) to grassroots protest — from the late 1970s through to the mid-1990s, AID, the World Bank and even the Paris urban-planning agency undertook projects to upgrade informal settlements, manage the metropolitan area’s expansion and rehabilitate the city's backbone infrastructure. More generally, donors sought to foster an administratively competent Egypt able to govern and service its capital without continual recourse to international funding. However such projects were largely unsuccessful in part because they clashed directly with the ‘politics of neglect’. For their part, the Sadat and Mubarak governments were primarily concerned with foreign funding for the (extremely expensive and highly uneconomic) free-standing new desert cities. 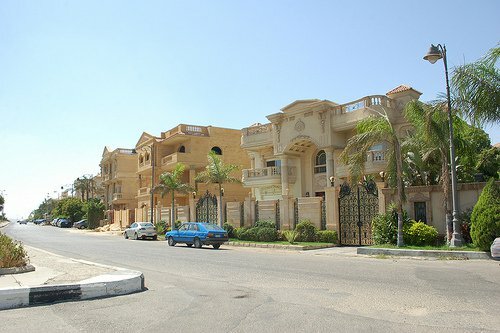 Donor efforts to rationalize Cairo’s expansion into the desert away from arable land were a casualty of the processes of land speculation which ultimately led to the gated community boom. While the role of informal Cairo in the 2011 Mubarak overthrow is sometimes contested, the ‘revolution’ indisputably led to its increased expansion especially in largely unserviced peri-urban areas some distance from the historic centre. Unlike some of the other city cases and urban phenomena addressed in this series, Cairo’s particular problems are not fundamentally those of neo-liberalism but rather of a neglectful and autocratic political order. However, the continuities between the Mubarak and post-Mubarak eras are striking. During the caretaker transition governments, ministers announced plans for a highly subsidized $5 billion housing programme to be funded by foreign donors — none of whom were forthcoming. The Cairo 2050 plan was not abandoned, and indeed shows signs of being resurrected by the Morsi government. The new constitution — passed in last year’s highly polarizing referendum — puts off local government reform. Parasitical ancien regime officials remain on the ground, now joined by the Muslim Brotherhood’s Freedom and Justice party cadres seeking to penetrate local government and society in the manner of the Mubarak-era National Democratic party. [i] Issandr El Amrani (2013), ‘The US Ambassador’s Speech’; Issandr El Amrani (2013), ‘The Brotherhood in Power, cont.’ ;Ursula Lindsey (2013),, LRB blog ; Steve Negus (2013), ‘Two Years of a Shrunken State,”; Elijah Zarwan (2013), ’Back Street’s Back'. [ii] Concerning the gated communities boom, see Eric Denis, 2006. ‘Cairo as Neoliberal Capital?’ in Diane Singerman & Paul Amar, eds. Cairo cosmopolitan: politics, culture, and urban space in the globalized Middle East. Cairo: American University in Cairo Press, pp. 47–71. [iii]W. Judson Dorman, 2007. The politics of neglect: the Egyptian State in Cairo, 1974-1998. Unpublished PhD thesis. London: School of Oriental and African Studies, University of London; David Sims, 2011. Understanding Cairo: The Logic of a City Out of Control, Cairo: American University in Cairo Press. [vi]Frederick Deknatel (2012). ‘The Revolution Added Two Years: On Cairo’; Elshahed (2011); Hazem Kandil (2011) Revolt in Egypt. New Left Review, (68).